Thelonious Monk gets kudos on “Well, You Needn’t.” The quintet makes short work of the intricacies of the arrangement, adding the double horn lead on the choruses, redefining this jazz standard. Sing-along-time. I grew up in a household with an older sister infatuated with Hollywood musicals: Oaklahoma, Carousel, The King and I, learning to recite The Farmer and the Cowman should be Friends. (It wasn’t Brokeback Mountain in those days). Miles taking on this song is a blast. A little more surface noise than I would have wished but its 50 years old, so be it. 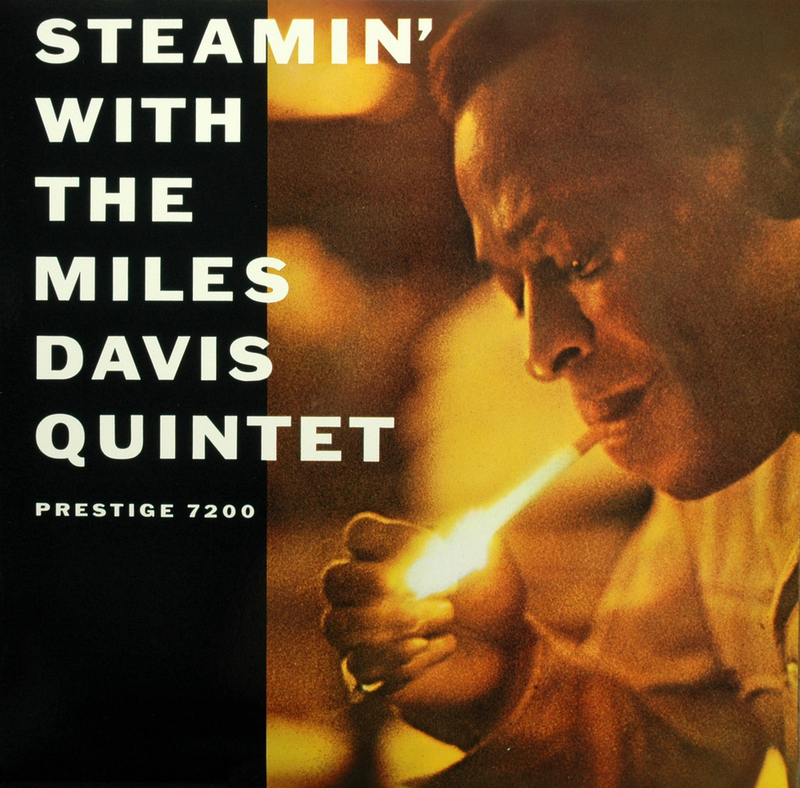 The First Great Miles Davis Quintet. Great. Just two sessions in 1956 resulted in four albums: this one, Relaxin’ , Workin’ and Cookin’ , undertaken by the Miles Davis Quintet to complete their contractual obligation to Prestige before moving to Columbia. 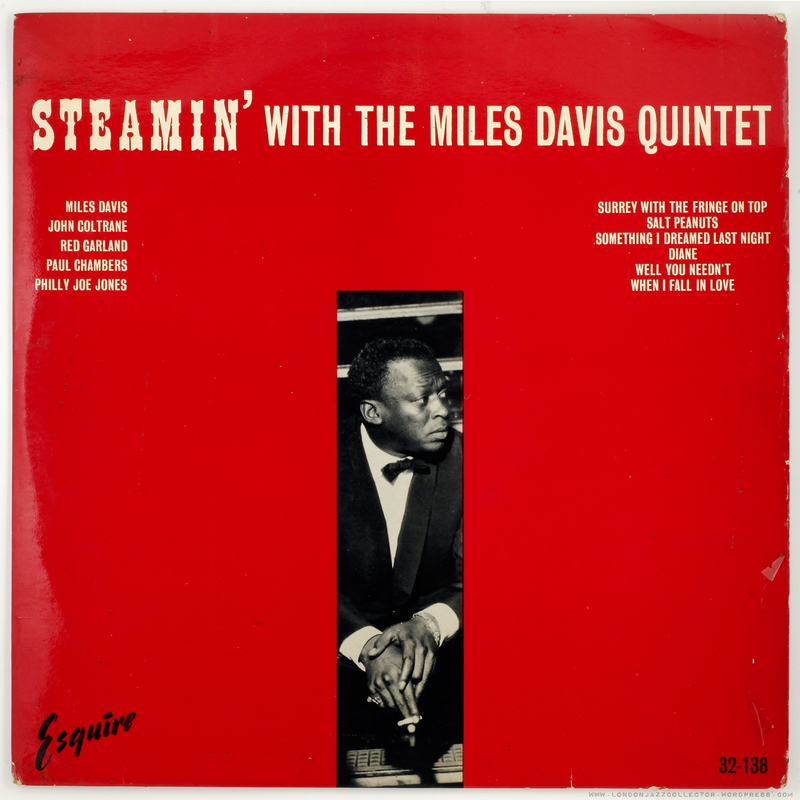 Steamin’ was released by Prestige several years later, in 1961, around the same time as Weinstock similarly released a number of earlier Coltrane recordings, making the most of what lay in the Prestige vaults of artists since contracted elsewhere.. The original Prestige cover (right) is dedicated to the missing Constitutional Amendment, The Right to Smoke. Rather than present new material which would go with them to Columbia, Davis brought the quartet’s live repertoire of standards into the studio, resulting in a thoroughly practiced and confidently executed body of work. The album contains one most unlikely tune, Surrey with the Fringe on Top from Rodgers and Hammerstein’s Oklahoma!, the sort of tongue in cheek selection you expect from Sonny Rollins. Ever considered taking up trumpet? Well you needn’t – theme and solo transcribed and played in its bare bones, by trumpeter and blogger extraordinaire Tommaso Urbano themusicofmiles. Karaoke Jazz, a remarkable dissection of what Davis was up to. As is usual with Esquire/Prestige, pressed with US supplied stampers, RVG mastered with RVG machine stamp, but no trace of the AB (Abbey Manufacturing) plant initials found on many earlier sourced Prestige stampers. Perhaps by 1961 Weinstock had widened his choice of suppliers. An alternative cover which is actually not bad considering it is from Esquire, but still gets a “fail” for putting the track titles on the front cover. Why? They are already on the back. Hey honey, we must buy this new Miles album, its got Surrey with The Fringe On Top on it. You know, Shirley Jones and Howard Keel wasn’t it Or Gordon Macrae? Got to have that. When I take you out in the surrey…with the fringe… on top! Great! Yet another from the late Brian Clark collection, cover in nice condition, as is the vinyl. For some reason Steamin’ had always eluded me in Ebay auctions, and this had been the missing title of the apostrophe ” in’ ” series for some years. Perhaps more rare, or a title collectors were less willing to sell when thinning out their collections, who knows. Anyway, now complete. 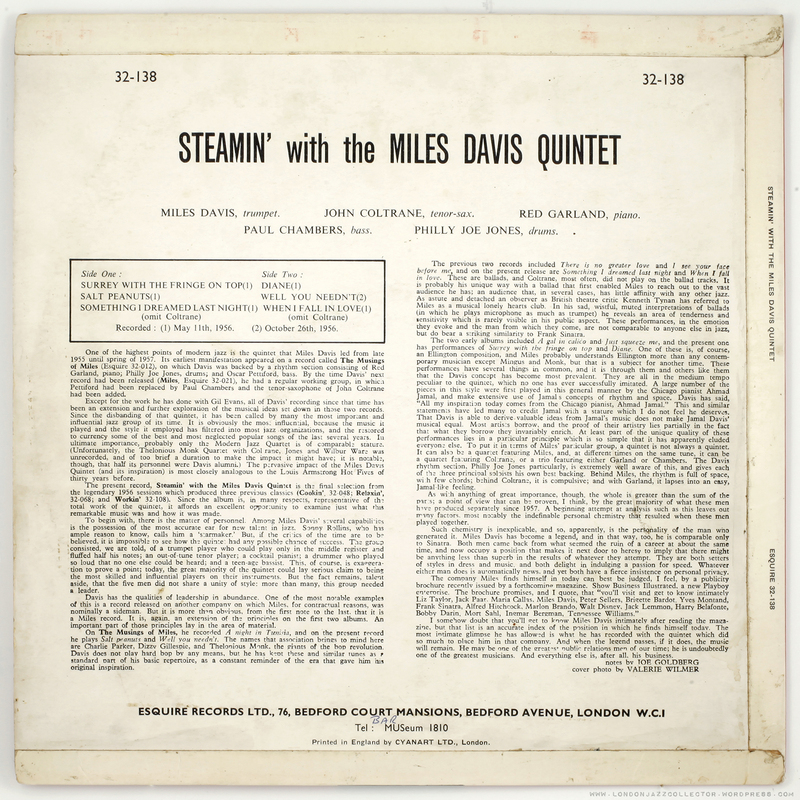 This entry was posted in Esquire, Miles Davis and tagged Esquire, John Coltrane, Miles Davis, Paul Chambers, Philly Joe Jones, Red Garland by LondonJazzCollector. Bookmark the permalink. I recently scored this record in great shape on a US Bergenfield pressing. Perhaps to your point about missing the ‘AB’ initials, compared to my other Bergenfields this one seems noticeably lighter. Also it doesn’t seem to have the flat edge that the others do. Further proof that it was probably pressed at another plant right? Almost certainly, another plant. From the variety of etchings, Prestige were pretty “promiscuous” in putting out their pressing business. The plant behind this one didn’t care to leave any identifying marks, though I did take a closer look to see if I had missed anything. There is what looks like a stamper code around 3 and 4 o’clock each side, a “1” with a pronounced serif, or it could be something more significant. The mysterious wonders of vinyl. Interesting and thanks for the info as usual. I don’t have the others in the “‘In” Miles Prestige series but from what I’ve seen those look to usually be on heavier vinyl having been released prior to “Steamin'” and probably pressed at Abbey Road. Is that your understanding as well? The cover photo was taken on Miles’ first UK tour during the autumn of 1960….. I gather from Vic Ash, who toured opposite Miles on this package, that there was a lot of smokin’ on the band bus. Mr. P.C. it seems was neither P.C. or especially well behaved. andrew, you’re hilarious. i love that one! why have Esquire printed the six titles of the tunes on the front, whereas they are in detail on the rear? I can see one reason: to have something opposite the names of the members of the quintet, some sort of creating a balance, something printed on the left, something on the right. My favourite Esquire sleeve of the M.D. quintet is 32-048 (ha, ha!). 32-108 is dramatic, Miles’s picture barely visible, no design to speak of. The red 32-138 is acceptable, but poor compared to the original. A close friend had inherited a small stack of Jazz LPs. It was the jazz collection of her recently deceased husband and we knew next to nothing about them. I remember noticing the odd squiggly “767 LEXINGTON AVE” on a copy of “Miles Davis Vol. 1” and the first time I had seen a 10-inch LP – “Lester Young Trio”. We would casually through them on a cheap pawn shop record player with no idea of how rare or valuable they were. I often wonder whatever became of those records which would set my heart racing if I came across them today. Ah, the foolishness of youth (in my case followed by the foolishness of adulthood). For me, one of the highlights of this record is Philly Joe Jones’s 3 minute(!) drum solo on “Salt Peanuts”. Normally, I count myself among the folks who look upon drum solos as an opportunity to use the restroom before the music starts backup again, but Philly Joe is by no means your average drummer.